Everyone who has followed the story of Rock and Roll knows it has been an uphill battle, especially with Rock. With great sadness, but continued inspiration, we regretfully announce that this will be the last update to include our gentle giant, Rock. After some down time in Rock’s exercise regiment due to some swelling, I decided to resume his physical therapy the day after Christmas and did just two rounds of his therapy pattern. Trooper that he was, he tried with all his might, but his hips were listing terribly to the left and he knocked every one of the three ground poles as he went over them the first time. The second time over the ground rails, he only hit two and cleared one. The third time over, he just grazed one. Afterwards, when I put him back in his pen, he lay down immediately and just went flat out for a few seconds before rolling back onto his chest again. It was then we noticed the bulging in the coronet band of his left hind foot. He was “sinking!” We called the vet immediately and he confirmed my fear. The lamina was pulling away from the hoof wall and allowing the bones to “sink” into his hoof. It wouldn’t be long before the other feet would follow suit. It was clear he was in agony and would have to be put down. Of course, it was Monday, a holiday, and no businesses were open, not even the renderer. I suggested to the vet that I would like to do a necropsy to find out just what we were up against and to salvage his skeleton for teaching purposes. My vet said he would check with CSU, but that they would be on vacation until January 17th. I knew Rock couldn’t make it much longer and just resolved myself to the fact that it would have to be the renderer. So, my vet loaded him up with anti-inflammatory medicine and said he would be back the next afternoon. The next day, my vet called and said the president of CSU had agreed to pull in a team for the necropsy and preservation of the skeleton. He thought perhaps the assembly of the skeleton could be done this summer as a project for the veterinary interns. Then, after saying our goodbyes, it was time for us to let Rock move on. He took his last steps surrounded by his Lucky Three family that afternoon. When the necropsy came back, it didn’t show a fracture of Rock’s pelvis, as we had thought, but instead, multiple fractures in the ball joint of the hip. The better part of the socket of the joint was almost completely gone on the bottom, with a hole the size of a dime on the top part. The head of the femur had no cartilage left and there was fibrosis and cysts the entire length of the stem of the femur. It was an incredible amount of injuries for a single mule. Every day for the entire year, I had prayed for a miracle for Rock, and each time I prayed, he got better for awhile. I wondered why God hadn’t given us yet another miracle and let him live. But I realized that I HAD gotten a miracle. The miracle was that our courageous and noble Rock had been able to live a quality life for one more year…that he had proven our therapy can work… and that he lived long enough so his half-brother of 20 years, Roll, was able to bond with people who would love and care for him the rest of his life! God bless you, Rock! We will all miss you and are thankful for all you have taught us. So sorry Meredith. He lived with love and dignity while with you. Bless his dear soul and I will be praying for you. Run free dear Rock…you’ll be missed! Meredith, my heart goes out to you. 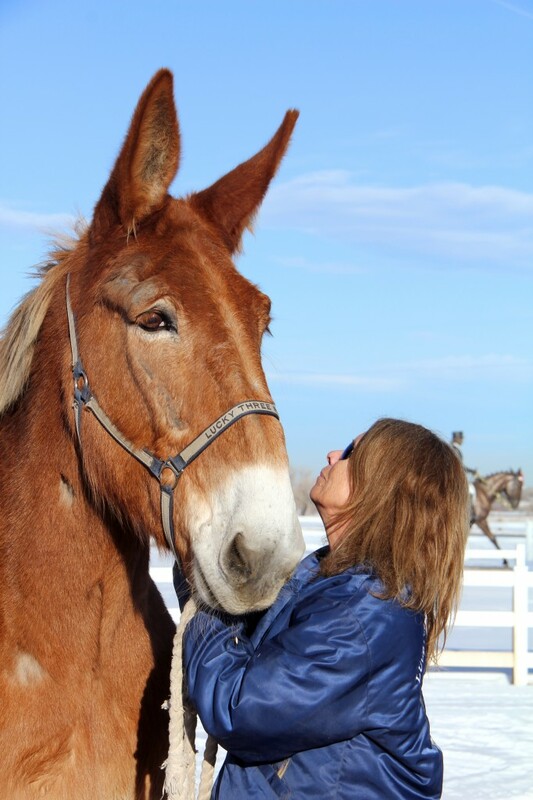 It is so hard to lose a loved one and I know you love your mules as much as I love my horses. You’re in my prayers. You did what was best for him. Now he can run free…of the pain. Sending healing thoughts to you, the Lucky Three Ranch staff and all of Rock’s equine friends. This is one of the hardest things to prepare for. To most of us,thay mean so much more than the word animal. My first rescue is a throughbred. He twists his hip when he walks but is still young. My vet said he has a lot of years left but still dreading that day you have to make that decision. Meridith you are very brave and compassionate and for that I take my hat off too you. As for Rock,people can say what they want but I believe God wound not have made such a magnificient Mule if he didn’t have a place in heave for him. God bless. Meredith, so very sorry for your loss. What a beautiful boy. What a tough time. I’m so sorry for your loss but I know God is happy to have such an angel! What an inspiration you and your animals are–thanks for sharing so much with us. Thank you for all that you did for these two wonderful animals and may God Bless You and all those who cared for them. It was difficult to read this article through tear-filled eyes. But, read on I did. While we don’t always understand God’s plan, the why’s and wherefore’s; I do know this: having loved and cared for all types of animals great and small, my entire life, God’s design is perfect in that our lives are made better for every second they share themselves with us. My Heart is full knowing there is one more Equine Angel watching over all of us horse/mule/donkey lovers everywhere on this blue marble. While Equids hold a precious place in my heart, all of God’s creatures bless us here on earth and in heaven above and make our lives here more bearable. The Lord bless you and keep you Ms. Hodges.